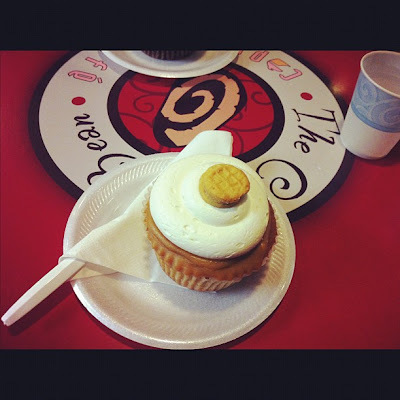 I tried a new cupcake flavor this week! On Monday, my BFF and I went out to soothe her after a terrible-horrible-no good- very bad day. We indulged in a little treat and laughing until we cried. It was just what the Dr. ordered. This new flavor was Fluffer Nutter. It's a peanut butter cupcake topped with a peanut butter ganache, and a marshmallow buttercream. It was tasty, but rich. If you are a peanut butter lover, this one is definitely for you. It doesn't break my top 5, but it's always fun to try new flavors. I'll be back tomorrow with a few more layouts.